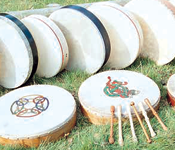 The Bodhran (or more accurately Bodhr�n) is the traditional Irish Drum. Made from a round wooden frame, with an animal skin stretched over it. The bodhr�n (pronounced bow-rahn) is the heartbeat of Irish traditional music, and is a hugely popular choice with our customers. Capable of surprisingly complicated rhythms, when played well it can really lift the music. You don't need to be able to read music to play; get yourself a Bodhr�n and you will soon be able to join in with the music.